Somehow days turned into weeks, and then months without blogging. Yesterday I received an e-mail asking if i was ok, so I figured I'd better write a post....thank you for checking in on me Chooky! 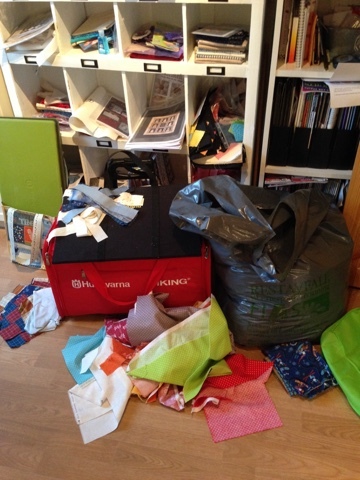 Although I haven't blogged, I have been sewing,and my sewingroom is a mess, as you can see in the blurry pictures. But sewing these little 6" blocks is more fun than cleaning.... I went to a Brenda Riddle class at Quiltegaarden a couple of weeks ago, and had such a great day there. I still need five more blocks for the tablerunner though, and I am not cleaning the sewing room until they are finished 😃. Tonight I almost finished this table topper for my daughter. 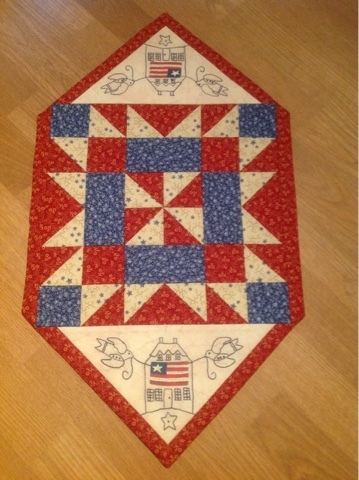 It just needs a bit of quilting, and should be finished before July so she can decorate their apartment a bit for the 4th of July. Well, that's it from me for now. I am not sure anyone is still reading my blog, but if you made it all the way through to this I thank you, and I really appreciate your visit! 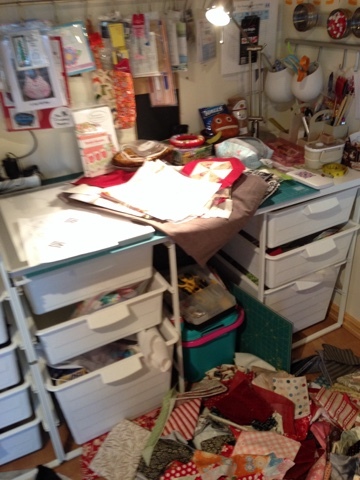 Glad you are sewing, and I love your projects!! I'm glad you're still sewing.......good to see you back. Lovely to see you. You have some wonderful projects. Ha -- look at all of us that are still here! So nice to have you pop back in. 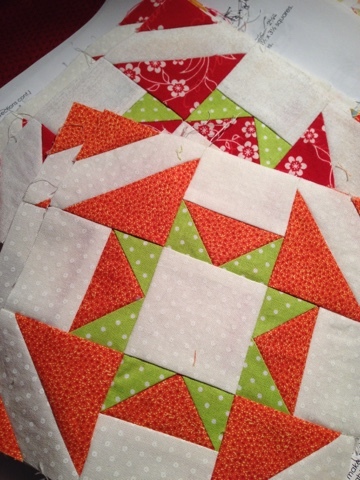 I LOVE that orange and green quilt block -- what a great combination of two favorites -- the star and the churn dash -- very clever. One of our good family friends is in your country this week. He's jumping off the fjords in a squirrel suit. He's crazy -- I hope you don't hear about him on the news!